David Beckham Homme is a fragrance for a successful and charismatic man. David Beckham Homme 100ml. Eau De Toilette is a fragrance for a successful and charismatic man who assert itself wherever it appears. It is a fragrance that is to reveal the secrets of successful football star, fashion icon, a husband and father, David Beckham. This fragrance is simply a stylish man who knows what he wants and with great effort, it always reaches. Top notes attract fans of spicy aromas dominated by notes of black pepper and ginger-drenched freshness of citrus fruits. Virility and strength is most developed in the heart of the fragrance, where you can feel sensual leather, cashmere and aromatic rosemary. Sensuality and seduction is hidden in the base of the scent, which fully reflects the characteristics of a successful man. Musk, patchouli and mahogany wood stand perfectly leave your charm and style, which is traversed fragrance to the smallest detail. 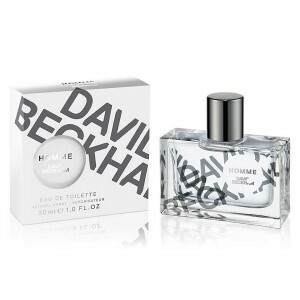 David Beckham Homme is a wonderful fragrance, which was launched in 2011. Then, as he became the owner of that name icon success in the world of football, so the fragrance Homme become an icon of success in the world of men in conquering beautiful women. It is stylish and contemporary fragrance, released in 2011, thanks to the fruitful cooperation couple Beckham and master of perfumery from France Pierre Negrin. David Beckham wanted to create a perfume that would fully reflect the charisma, charm and personal style of this superstar. We can note that it is perfectly possible. Chords fragrance Beckham Homme - the embodiment of personality famous athlete. The original composition reveals notes of citrus, full of infinite energy, which perfectly match with Sichuan pepper and ginger. Rich "heart" of the perfume bouquet is made ​​of leather and cashmere wood, highlighted an unexpected touch of rosemary. Deep and balanced flavor base is formed of fragrant notes of musk, patchouli and mahogany. Bright aroma in an elegant glass bottle, Beckham Homme - must have for the modern gentleman.